Welcome to a rich and dynamic summer college. Our courses bring together cultures, ideas and study to form a stepping stone for your future academic and professional success. 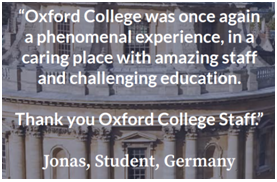 Oxford is home to wonderful architecture, history and to some of the greatest thinkers of the world, you are invited to become part of that wonderful heritage. Students travel from around the world to become part of our academic family, forming a remarkable community each with cultures, passions and ideas to offer and learn. This is Oxford College Summer School. Our Medicine course has been designed to be a comprehensive, interactive course for the doctors of tomorrow. During this course, students will develop their knowledge and understanding of the world of medicine, through the theoretical and practical skills involved in being a doctor. Students will focus on the study of human biology, the analysis of patient symptoms and the response to key medical issues. As well as receiving a certificate and report at the end of their stay, students will leave with a First Aid qualification. Students at the Oxford College Summer School will stay at one of three Oxford University campuses: St Hugh’s, Wycliffe Hall or Corpus Christi. Students will be assigned to a campus based on their subject choice. All of our colleges provide comfortable, traditional university accommodation. There are separate boarding areas for male and female students and all accommodation consists of either single or twin study bedrooms. At the heart of the SBC Summer School, the experience is the truly international environment. During summer 2016 we were delighted to welcome students from over 100 different countries to SBC. Once again in 2017, we look forward to welcoming students from all corners of the globe to spend the summer with us and make friends from around the world. Our London Day enables students to experience the sights and attractions such as Big Ben, Covent Garden, Big Ben and the Shard of the bustling capital city. Students will also visit famous shopping areas, before dining out and ending the day with an iconic London Experience. We Also Visit Brighton, Bristol, Cambridge and Thorpe Park.